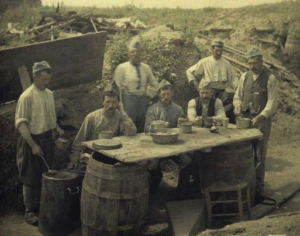 It is perhaps a little known fact to those outside the field of American History that during World War I the average American soldier spent more time in Europe under peacetime conditions than wartime conditions. 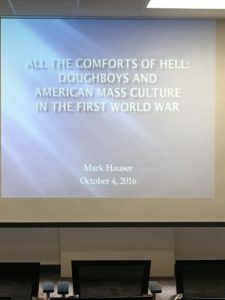 In the annual James P. Danky lecture, Mark Hauser, fourth-year doctoral student at Carnegie Mellon University, discussed his interest in understanding how WWI soldiers, known as doughboys, created a sense of comfort for themselves while in France during both the fighting and the peace-keeping times (1917-1920). Hauser came to Madison, WI for two weeks in the summer of 2016 to consult soldiers’ diaries and letters held at the Wisconsin Historical Society and the Wisconsin Veteran’s Museum Archives. From his research, he hopes to parse out the meanings that US soldiers gave to certain popular consumer goods, and how these same soldiers used consumer goods to shape their lived experiences when off-duty. 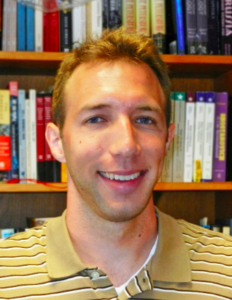 The voices of the soldiers in Hauser’s dissertation include a diverse range of women and men from different areas in the US, as well as Jewish and African-American military personnel. 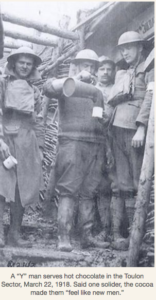 Hauser’s study comes out of an awareness that in 1916, the year before US entry into WWI, the public image of a typical American soldier was anything but popular. When Army General John J. Pershing was sent to deal with raids over the US-Mexican border led by Pancho Villa, American soldiers went with him; and in a relatively short time, these same soldiers gained a widespread reputation for gambling, drinking, and frequenting saloons. A year later, with the prospect of a European theatre, General Pershing took it upon himself to invite the YMCA – with its highly-praised morals and work ethic – to help organize and manage soldiers’ canteens abroad, in the hopes that via the establishment of canteens, the YMCA would also make steps towards “managing” soldiers’ behaviors. In France the military and YMCA offered soldier’s an array of leisure activities such as entertainment programs, athletics, and the development of resorts for leave time. Each of these outlets has a dedicated chapter in Hauser’s dissertation. Tuesday’s presentation however figures in a chapter that will discuss the influence of American consumer culture in Europe in WWI. Hauser hopes to argue that while the military and YMCA may have controlled the selection of consumer goods available, it was military personnel themselves who chose to attribute meaning to those goods, to varying degrees. In other words, despite the military’s desire to “manage” soldiers’ behaviors from above, military personnel played a central role in “managing” their own behaviors through the meanings they attached to the goods they purchased and received. The letters and diaries Hauser has examined provide an intimate perspective on life away from home. Some soldiers wrote about how much care packages meant to them and asked family and friends to keep them coming, attributing more meaning to goods from loved ones than from the canteen. Others talked about the high price of cigarettes at the canteens. Even though the YMCA canteens provided many of the comforts of home, including hot chocolate and candy, certain letters requested that families and friends never give another penny to the organization. Women often wrote with regret for the little money they could send home, an interesting commentary on gender disparity in the military. It turns out that while male soldiers had food and lodging expenses covered when overseas, women had to pay for their own. Hauser is now in the process of analyzing the evidence from Wisconsin archives and creating a cohesive narrative.